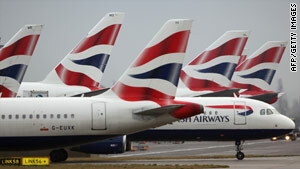 A strike by British Airways cabin crew could ground the airline over the holiday season. London, England (CNN) -- British Airways announced Tuesday it is seeking an injunction to prevent a strike by cabin crew from going ahead over the busy holiday period. Cabin crew plan to strike between December 22 and January 2, according to the Unite union. No flights have been canceled yet, but what do you do if you're holding a BA ticket for the holidays? Here is some advice. What do I do if I'm scheduled to fly during the strike period? Make sure British Airways has your correct contact details so they can let you know whether your flight will be canceled, and whether they can book you on a new flight. You can do this via their Web site, britishairways.com, or by calling a BA ticket office. Video: BA strike: What to do? British Airways says passengers flying during the potential strike window and 48 hours on either side of the strike window may change their bookings for a date up to 12 months in the future with no penalty. This applies to passengers holding either a flexible or restricted ticket, a BA spokesman told CNN. To change your flight, call BA, your travel agent, or the person through whom you booked your ticket. This will not help those passengers who want or need to be at their destination on specific dates and can't fly because of the strike, however. If you are thinking of booking flights with another airline, keep in mind that BA will not be obliged to refund your money if the strike is called off and they can operate the flight as planned, warns the Air Transport Users' Council, Britain's consumer watchdog for the aviation industry. There are few seats left on other flights during the holiday period, so any tickets are likely to be very expensive. Will British Airways refund my ticket if I can't fly? If your flight is canceled because of the strike, BA will offer the choice of a refund or rebooking you on another flight, whether on BA or with a rival carrier. BA will only give you a refund if the airline officially cancels your flight, however. CNN Aviation Correspondent Richard Quest points out that this puts passengers at a disadvantage, because by the time your flight is canceled it may be too late to get on another flight and make it to your destination in time. "BA's failure to release passengers now from their flights so they can make other arrangements, will make it more difficult for those booked to travel over the period," Quest says. "Many passengers, especially those traveling with families, need a refund to pay for new tickets. There is a real risk that by the time BA is prepared to give the refund there won't be any seats left." Will British Airways help me cover the cost of meals and accommodation if I am stranded abroad? A BA spokesman said the airline is still working on a contingency plan and could make no immediate announcement regarding accommodation and food for stranded passengers. Passengers who booked their flights before the strike vote was announced November 2 should be covered by their travel insurance, but any flights booked since then are not likely to be covered by standard policies, according to Rochelle Turner, a researcher at Which?, an independent consumer magazine. Passengers should check with their insurance providers, she says. I booked a hotel room and rental car at my destination. Will BA compensate me if I can't use them? The BA spokesman said the airline has made no decision on compensating passengers for missed hotel room or rental car bookings. Check your travel insurance to see whether such costs could be covered.